Pioneers in the industry, we offer stainless steel tanks, horizontal milk storage tank, ghee storage tanks, aluminium storage tank, aluminum tanks and cream ripening tank from India. 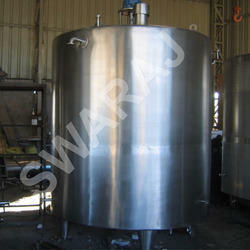 Clients can avail the offered range of Stainless Steel Tanks. The offered tank is fabricated using premium quality steel and stainless steel and current technology, under the supervision of our skilled professionals to deliver flawless range to the clients, this tank is tested on various predefined quality parameters. We offer this tank in various customized options and deliver within scheduled delivery time. Clients can avail this tank from us as per their requisites at affordable rates. We also offer installation service for our offered tank. We are glad to present a wide collection of premium quality Horizontal Milk Storage Tank to our valuable customers. You can avail these Horizontal Milk Storage Tank from us at affordable prices. These Horizontal Milk Storage Tanks are made out of high-quality raw materials with the help of high-tech machines and by applying advanced methods under the stringent supervision of our team of professionals. Backed by the outstanding effort of our team of research and development and the help of our procuring agents, we are able to provide extensive lines of Ghee Storage Tanks to our respected customers. These Ghee Storage Tanks are widely used in different food processing industries for storing Ghee. These Ghee Storage Tanks are fabricated under the stringent supervision of our work force. High tech machinery is used at the time of making these Ghee Storage Tanks. 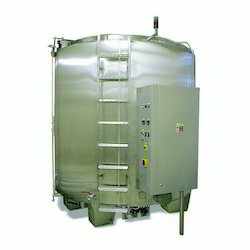 These Ghee Storage Tanks are available at leading market prices. 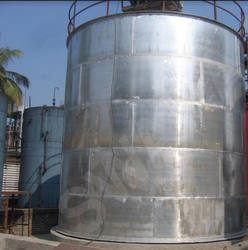 Aluminium Storage Tank dealt in by us are manufactured using premium grade raw material and contemporary machines in conformity with set universally accepted norms of quality. In addition to this, our offered products are highly appreciated by our clients for their several qualitative features. 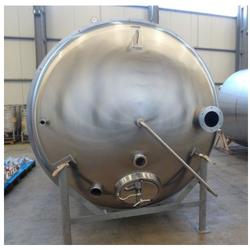 These Aluminum Tanks are used in both medium scale and large scale industries. High-quality raw materials are procured at the time of manufacturing this equipment at our ultra-modern infrastructural unit. 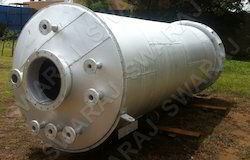 Clients can avail the offered range of Cream Ripening Tank. The offered tank is fabricated using premium quality steel and stainless steel and current technology, under the supervision of our skilled professionals to deliver flawless range to the clients, this tank is tested on various predefined quality parameters. We offer this tank in various customized options and deliver within scheduled delivery time. We are the leading manufacturers of Nitric Acid Storage Tank. These tanks are TIG Welded manufactured under controlled conditions to get the optimum designed performance. We have experienced team of workers for manufacturing of Aluminum Tanks. We have manufactured tanks with internal pressure tested with the hydraulic test. 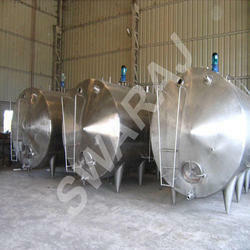 Tanks with Conical, Flat, Torisperical, Ellipsoidal Dish ends are also designed as per requirement. We follow the Quality Assurance Plan, WQP with thorough testing of Raw material, Weld Joints, DP test, X- Ray Radiography and Hydraulic Test (Optional). Our Tanks are used by Defence Organizations, Explosive Manufacturers, Chemical Industries, Process Industries, Distilleries etc. With the help of our procuring agent and the hard working of our team of development and research, we are able to supply a wide collection of Chocolate Storage Tank to our respected clients. These Chocolate Storage Tanks are widely demandable by all our customers for its durability and reliability. These Chocolate Storage Tanks are used for storing chocolates in various industries. High-quality raw materials are obtained at the time of manufacturing these items. According to the needs and demands of our clients, we are engaged in offering a wide range of Hydrogen Peroxide Storage Tank all over the country. Our entire product range is as per the exact presences of our clients. In addition to this, Peroxide Storage Tank is as per the set industrial standards and guidelines.